I love to travel! Used to be, I made international trips at least once a year, both for work, and visiting my family back in Australia. Five trips, one year! And I’ve also made a huge change involving travel – emigrating from Australia to England, half the world away. Now, unfortunately, I’ve developed a travel triggered health issue. Even a car ride to the local supermarket can make me sick for a week, let alone thinking about the trip to the airport and taking a flight somewhere. So if travel is out, what’s a girl to do? One easy answer – read! Far cheaper, no need to pack, no airport crowds, and no jet-lag or travel-induced symptoms. Phew! I’ve always enjoyed books that transported me somewhere else, whether to another time, another place, or both. Childhood favorites like the Anne of Green Gables series taking me to PEI. Elyne Mitchell’s Silver Brumby books – that’s an Aussie series that may not have made it overseas, set in the Snowy Mountains with a wild horse as the main character! The Lion, the Witch, and the Wardrobe books, moving me first to England and then to Narnia. Other stories took me to the Outback, or the USA, or even into outer space! Then I discovered romance. Oh my! Georgette Heyer’s Regencies took me both back in time and to England. In Harlequin romances, Essie Summer’s New Zealand set clean romances (all unfortunately no longer available) became keepers to read and reread. No surprise I now love to write romances with international settings. I have plenty of ideas for books set close to the little part of England I now call home, but they’re in a long queue of books waiting to be written! Though London, setting for much of the stories in the Love in Store series, isn’t too far away, Scotland, setting for the Macleans is. And Idaho, the setting for Huckleberry Lake, and Oregon for Sweetapple Falls, far further again. One day, I’m hoping to write an Australian series too, set in a small coastal community. It’s waiting in the queue, too! For now, it’s Italy. As well as the wonderful themes of faith, family, and forgiveness (don’t we all need those! ), the setting is another reason I’m so excited about the A Tuscan Legacy series. I only visited a tiny corner of Italy once, literally for one day! Not Tuscany, sadly, we just drove over the border from France, ate a wonderful meal and probably the best ice cream I’ve ever tasted, then drove back. I’m not sure I’ll ever be able to go there. But what’s not to love about writing stories set there? My books in the series have international settings. Wales (Cardiff the capital city, and the beautiful Brecon Beacons) and Tuscany for Dolce Vita. Rachel and Jonathan drive along a Welsh country road very like the one in the first picture. Then it’s back to Tuscany again for the final book in the series, La Risposta. I’ve loved doing the research for the settings. Google is an author’s best friend! And Marion, of course, who was blessed with a real life journey to Tuscany last year. Her amazing photos are almost as good as being there! You can see the wonderful images from her trip on the series website. On top of my imaginary travels for my books, I’m getting to travel to new places as I read the other books in the series. Tuscany in That’s Amore. Washington DC in Luna Rosa. Texas in Rapsodia. Rome in Ti Amo. Not too far away in La Fiamma, set in London and nearby Reading, England. All over the world with Piero, the globe-trotting photographer in Bella Notte. And back to my birthplace of Sydney, in Solo Tu. This book is set in the beachside suburb of Sydney I was born in! Almost as good as a trip home. What’s your favorite romance with a special setting that’s transported you somewhere else? One comment on this post before May 18th, 2018, will be randomly chosen to win an ebook copy of my London Loves four-book set, containing the story that triggered the A Tuscan Legacy series! I agree about books. Sorry you now can’t travel and even a short trip makes you sick. I loved some of the books you mentioned. I loved Narnia. I fell in love with Enid Byton and her books. I loved the Billabong books (forget the author) but the first book is The little bushmaid and is set in the out back. Seven little Australian’s was another. I read a couple of books set in America which made me want to visit certain sites. I always remember Pollyanna and the Man who had Prisms in his house and how the light hit them and reflected the light. I always wanted some to hang for the same reason. I love how books do take you to different places. Hi Jenny! Mary Bruce Grant wrote the Billabong books. I once had a lovely collection of very old hardcover copies I’d picked up in op shops. I seriously regret selling those when I moved to the UK! And oh yes, I loved Pollyanna’s prisms, too. I spent a lot of time with Pollyanna last year. I thought I was just doing a quick read though to get some insights for a character I saw as a Pollyanna type. Ended up putting that romance on hold and writing a jornalling devotional based on Pollyanna instead! I wish I could remember the author of a series on twins I loved as a child, too. I never owned any, but the small local library had a set. All I can remember is where they were shelved, which I think means they were fairly early in the aphabet! They were stories based on twins all around the world and also going back to times in the past. They took me so many different places! That’s right I had some older hard back books and some of the newer books. Mum read them when she was a teen and found them when I was about 15 or 16 and bought me a few. I loved Pollyanna and then Pollyanna grows up. I also loved Heidi and then Heidi grows up also. I also loved the Peggy books. was it the bobbsey twins? Do you remember Sally Baxter Junior Reporter? There was a lady in the church who gave me a lot of her daughters books. Among them were the Sally Baxter books, The Cherrie Ames books, and the Peggy books. Hi Jenny! Oh, amazing to have an author come to your school! I would have been thrilled if that happened but unfortunately we didn’t ever have one visit. Your teacher did a great job! I read all those same books and loved them. So many good books. The twins books weren’t the Bobbsey Twins. It was a different set of twins every book. So it would be The Eskimo Twins, The Chinese Twins, The Cave Twins. When I’m not facing urgent deadlines, I need to Google and find those. They would have been published either late 50s or early 60s. Its by Lucy Fitch Perkins, I googled for you. In Canada, it’s the same – often cheaper to travel to a different country at a far greater distance than across our own! Crazy. Hi Wendy! Oh, thanks for reminding me about Colin Thiele! As I wrote the blog post, I was thinking of one of his books, but I couldn’t remember his name or the title. About two kids who walk across the desert. I read voraciously as a child, at least a book a day. We’re very blessed here in Europe to have so many countries just a short flight away. Australia is so big! Flying from London to Australia, travelling across the whole of Europe is quicker than the part that’s flying across Australia. Oh yes Colin Thiele. We had a grade 6 teacher who loved his books and use to read to us. We read Sun on the Stubble and February Dragon. He came to our town and was visiting with the grade 7’s but because we were reading his books he took the time to come visit with us for about half an hour. It was such a big deal for us and I still remember it to this day. Hi Autumn. I enjoy traveling the world through books. No passport needed. Also no flight delays or hours in a cramped plane. 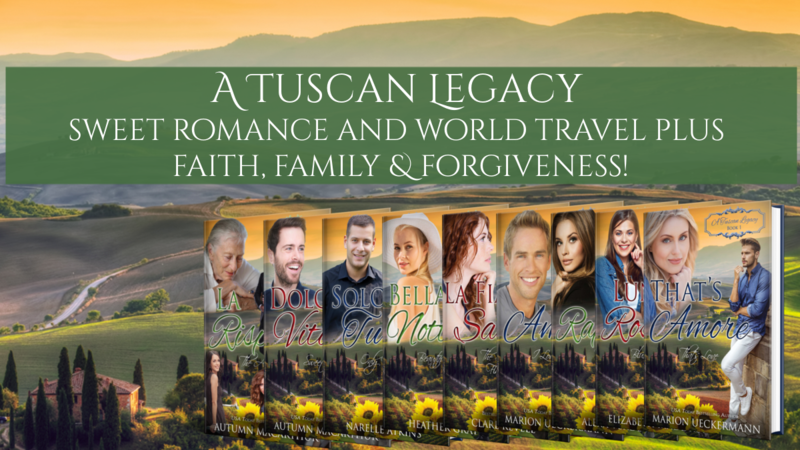 Enjoying the multi-setting in the Tuscan Legacy series. Best wishes and Happy Writing. With my son just returned to South Africa from Finland, I think our globe hopping days will be over for a while. We’ll probably be using that money now to fly down to Cape Town, 2 hours away, a few times a year. First trip, August … fortunately, I got flights at a good price. Thanks Renate! Yes, far more comfortable to travel this way! Enjoy your trip to Cape Town, Marion. So wonderful you now have Kyle so close! I’ve always enjoyed traveling. Like you, due to health issues my husband & I are no longer able to travel. Due to my Dad being in the army I moved quite a bit, husband’s job moved us around the Southern States. Now we are both retired. I love to read about places that we’ve visited or I long to visit. At least through books no “jet lag” nor being in bed for a couple of days to recuperate. My favorite genre’ (no matter the setting) is Christian romantic suspense. I also love Biblical fiction, WWII, about any era except Regency. When I was young there was an over abundance of Regency & they all started sounding alike. I will read them but just not my favorites. Best wishes with your writing. Wow, Pat, it sounds like you’ve done plenty of travelling! Yes, books are by far an easier way to travel. I stopped reading Regency romances for the same reason. Too many that sounded the same. Now it’s a pleasure to go back and dip into the originals – Jane Austen and Georgette Heyer. Autumn, I am so sorry to hear about your illness, I will most definitely keep you in my prayers! I cannot imagine the suffering you must go through daily. I am so looking forward to reading all of these books! Thank you for taking us on the journey with you! Thanks for your prayers, Paula. I’m enjoying the journey via the other authors’ books so much! I’m sorry you can’t travel, but happy you found ways of traveling through reading. I enjoy traveling, but not the trip so much (crowded planes, airport meals, jet leg), so reading is a fun and relaxing way of getting to discover new places. Hi Priscila! Yes, reading is easy, low-cost, and we avoid all the hassles of travel. Plus we can do it whenever we want! I’ve enjoyed my “book” trips to Scotland, but contemporary and historical. I’d like to visit someday. Me too! I’m kinda kicking myself with all the opportunities for travel I put off thinking “I’ll do that when I’m retired.” Now of course I’ve had to retire early and travel isn’t so easy finacially or physically. I do hope you make that real trip to Scotland someday. I’m hoping to travel back there via book soon – to Edinburgh for the final story in The Macleans this winter, then next year to the Highlands with a new multi-author series that’s in the planning stages! I’m so sorry to hear you can no longer travel without beoming sick. :-( I’m happy you were given the opportunity to not only see some of the most beautiful parts of world prior to falling ill, but also to gain an appreciation for all it has to offer, as there are some who have never even travelled beyond their own home town. I am a Spanish teacher of 19 years. Exploring new cities, learning about cultures different than my own, and discovering hidden treasures has always been an interest of mine. Unfortunately, on a teacher’s salary, I do more learning about than exploring, so, yes, thank goodness for books! :-) My favorite book to read is always the one set in a place I’ve yet to travel, and my favorite place to travel is always the one I go to for my first time. :-) Thank you so much for this giveaway opportunity! You are in my thoughts and prayers, and I hope with time your health improves. Here’s to many happy adventures as we journey through the pages, visiting worlds that await! Happy reading! Thanks so much for your prayers, Tara! I can imagine as a language teacher you have a huge interest in different cultures. So much diversity and so much to learn and value in the way other people live! My love of travel was restricted for many years by a nurse’s salary, like yours on a teacher’s salary. Then I was blessed with a wonderful job that gave me plenty of opportunity for travel. I hope you get plenty of chances to travel, too – both in real life, and via books and the internet. I love to travel through books to different places and back in time. We can’t afford to travel very far but it is fun to read about it. Lord bless your health . Books really do give the ultimate travel experience! Not only an instant journey to almost anywhere (waaaay better than the Start Trek transporter! ), but time travel too! Oops, typos! Star Trek transporter! Sherri, I just returned from a trip to New Zealand. We visited Hobbitland where The Hobbit and The Lord of the Rings was filmed. Such an amazing outing…I loved it! Hugs and prayers for your health condition, Sherri! Home, husband and cats sounds a wonderful combination. Oh, yes, Tolkien brought his imagined settings intensely to life for readers. I loved those books so much! Though book 3 was painful – we take every step of that slow reluctant trudge across Mordor with Sam and Frodo. And then returning to find the changes in the Shire! I shed so many tears every time I read those books! Marion, Hobbiton looks amazing. You took some wonderful photos! I confess to not having seen the films – I loved the books so much I didn’t want anyone elses’s vision of the places clashing with mine. Hi Kimberly! I’m sure you imagined many stories while staring at that painting. I love travelling in books! Can’t wait to travel to Tuscany in Dolce Vita and La Risposta! Soon, girls! Not long now! I have always lived “travel” through books. I’ve only traveled the western states here in the US, taking 4 week road trips every year with my husband and children. However since we bought the ranch 15 years ago we had to end those adventures to begin new ones. Those road trips sound wonderful. And living on a ranch is many authors’ and readers’ dream setting. Hoping when your husband retires you get those opportunities to travel! I enjoy a setting that is made up, a town that you love but doesn’t exist in read life. Those are fun to write too, Kim! I love my imaginary communities of Huckleberry Lake, Sweetapple Falls, and Haven Bay. I love being able to travel to many places through books. I have only been to a couple countries personally, but with books, I can see taste, and experience places I’ve only dreamed of. I have dreamed of traveling to Italy because that’s where my grandfather was from, but my husband doesn’t like to travel. So for now, it’s on my bucket list and I’ll just have to pray God will make a way. So when I heard about your series I knew I’d LOVE it, and I DO! It has been so fun to travel with all these cousins and live life through them. Thank You! We’re excited to have you on the Tuscan Legacy journey with us, Marylin, and so grateful for the beautiful memes you’ve been creating for each book. Hi Marylin! I’m praying a way opens for you to have that trip to Italy someday! 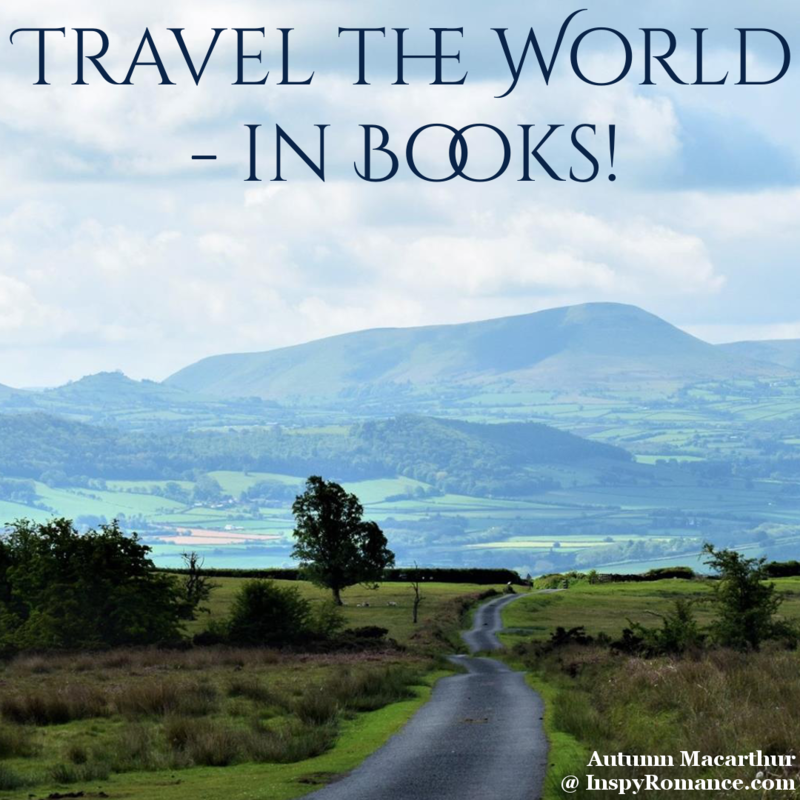 I love traveling and just got back from a trip to Spain and Italy – so your books sounds fabulous! To be able to read about the places I visited and remind me of the fun time we had just sounds wonderful! But to pick a single book that I loved is just impossible! So many good ones are out there! Kris, your trip sounds awesome! So glad for the fun times you had. And agreed on picking a single book being impossible. Even picking a top ten is impossible! Hi Autumn, I hate that you can’t travel anymore. Thank goodness for books. It’s much easier traveling by book anyway. I’m not much on travel for the fun of it or sight-seeing. I do like going to see family in other states, but I can’t imagine leaving the U.S. I always like reading books set in Australia though. Hi Sharon! I’m hoping God has some healing planned for me that will permit me to travel again. Not so much for fun vacations, but so I can get back to visit my elderly parents. And for sure, books are easier. No down side to a book – except that it ends! I have always loved to travel through books. Most of my life it has been finances that has kept me close to home. Now it is mobility issues. I read so many wonderful books that it is impossible to pick one that has transported me. I think that I’m just going to tell you my favorite place to visit. I have dreamed of going to England ever since I was a girl. I first went there in a book (I don’t remember which one though). I have never made it there in person but I LOVE every book visit I make. Hugs, Debora. At least book travel is affordable and easy on those of us with health issues. I was the same about England for so many years. My father is English, and he emigrated to Australia when he met my Aussie mother in Sydney. When I was six and my English Poppy Granddad visited, I promised him I’d come to England one day. I didn’t make it here till thirty years later. In that thirty year wait, I made many wonderful book journeys. And then a one year working holiday surprised me by turning into a permanent stay! I love History as well as Romances. In 1992, I found Brock & Bodie Thoene’s “The Gates of Zion” in a Christian Book Store. I fell in love with the story, the setting, the characters, & the authors. It’s set in Isreal in 1947-48, as they became a independent nation again. This story is the 1st book in The Zion Chronicles Series. I went right out & purchased the rest of that series! I’ve reread that series many times since then. I still love those stories, that’s why they’re still in my library to this day! So many people have recommended that series! I must go look it up. I love books where I learn some real history was well as enjoy a story. Thanks, Esther! I am loving this series, and I am especially enjoying Marion’s descriptions of the sites of Rome. I can’t wait until each new book comes out.